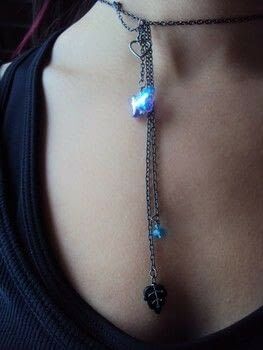 It can be a choker or a normal necklace. I made this necklace out of inspiration from a necklace how-to in a book from the library and from the necklace I saw P!nk wearing in her "Funhouse" music video. I found it a little tricky because of all the charms on the chains and trying to get them in the right place on the jump ring. I made it have one of those chains where you can choose the length of the necklace in back so it could be a choker or a normal necklace.